After a few hours skiing, you will definitely be hungry. There are many eateries directly at the ski slopes. Here you can get the fancy dishes with local flavors, or a quick baguette if the desire to ski more is the greatest. Havsdalskroa prides itself on local produce and quality food and drinks. 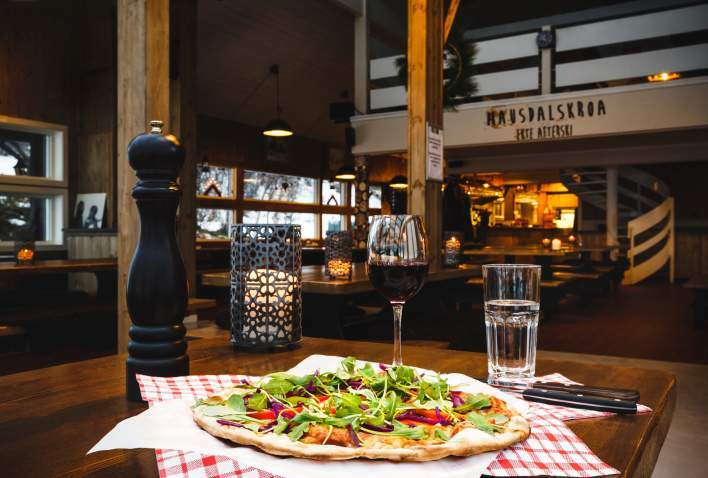 It is also very popular for its entertaining Apres Ski, and for those who would like Takeout it offers perhaps Geilo’s best pizza. Havsdalskroa is centrally located at the base of the lift system in Havsdalen. When the weather allows, Havsdalskroa moves outside, where you will be tempted with lots of delicious food from the barbecue. There is always a great atmosphere and lots of fun for young and old. Après from 13.00. 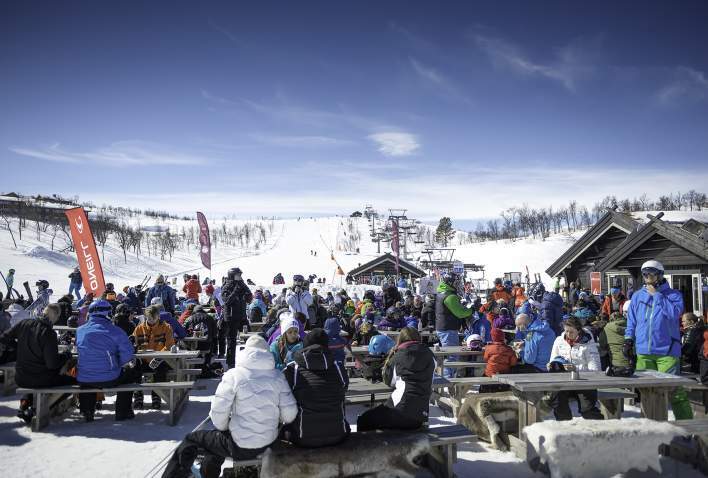 Slaatta Cafe is located at Slaatta with a beautiful view towards Geilo and Vestlia. Here you will find tasty and homemade food like freshly baked buns and other homemade baked goods. Also soup, hamburgers, hot dogs and fries. Grilling on the terrace if the weather permits it. Read more about Slaatta Cafe. Kakao med krem og marshmallows. Photo: Slaatta Skisenter, Linda Due-Boje. Close to the center of Geilo, nestled at the base of Geiloheisen, Taubanekroa has a lovely view of Geilo. It serves good homemade burgers, sandwiches, pastries and much more. You are Welcomed into a warm and cozy atmosphere with a roaring fire and lovely surroundings. Stugu Café is a natural meeting place in Vestlia with 160 seats on the 1st floor and 90 seats on 2nd floor. Stugu has a more mdoern and cozy look. Stugu offers a large selection of hot and cold dishes and "Today's menu" at 11.00. Après ski starts at 13:00. Grilling outdoors when the weather permits! Kikutkroa is located next to the Kikut parking lot and the ski slopes at Kikut. Especially important for Kikutkroa is to serve healthy, nutritious and tasty lunch and dinner dishes. Homemade food from the bottom, and pure raw materials is the main philosophy of Kikutkroa. After skis from kl. 1:00 p.m..